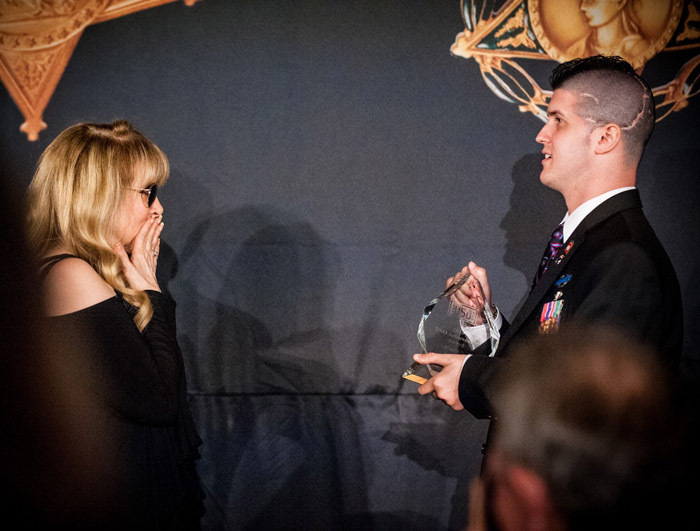 Stevie Nicks, along with 27 Medal of Honor recipients, was honored in Washington DC last evening at the USO-Metro 33rd Annual Awards Dinner. Nicks was acknowledged for having spent the most hours visiting combat-wounded servicemen and women. The award was presented to Nicks by Cpl Vincent Mannion-Brodeur who was in a coma for over a year. Nicks has stayed in touch with Mannion-Brodeur and his family over the years as he continued his stunning recovery. As part of USO Metro’s Celebrity Handshake Tour, Nicks also donated hundreds of iPods she personally programmed with music to the returning vets who she spent time with during their recovery at Walter Reed Army Medical Center and Bethesda Naval Medical Center over several years.